A French composer born in 1950 in Lyon. A violinist by training and possessing a degree in art and archæology as well as in philosophy, Édith Canat de Chizy was the pupil of Ivo Malec and Guy Reibel, with whom she studied electroacoustics at the Paris Conservatory. In 1983 her encounter at the Conservatory with Maurice Ohana left a deep imprint on her career. 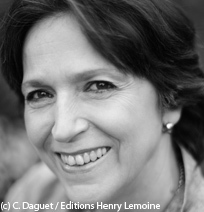 The first female composer to be elected to the Académie des Beaux-arts (in 2005), she has been teaching composition at the Paris Regional Conservatory since 2007. With the emphasis on concertante music, her approach is to highlight, through the original treatment of sound matter, energy and movement. Her works include: Yell (1985, premiered by the Orchestre Philharmonique de Radio France), Moïra (1998, concerto first performed by the cellist Sonia Wieder-Atherton), Les rayons du jour (2004, commissioned by the Orchestre de Paris), Vuelvete (2007). Les partitions d'Édith Canat de Chizy sont éditées par Henry Lemoine. CANAT DE CHIZY Edith. Du spirituel dans l'art. Revue des deux mondes, 2001, no 1, p. 48-53. CANAT DE CHIZY Edith, PORCILE François. Maurice Ohana. Paris : Fayard, 2005, 600 p.
GUITTON-LANQUEST Pascale. Edith Canat de Chizy : Canciones del Alma. Intemporel, mars 1997, n° 21, p. 1-6. PORCILE François. Edith Canat de Chizy : entre nécessité et liberté. Neuilly-sur-Seine : Cig'art éditions, 2008, 183 p.